Web browsers, Known and unknown browsers. There are more browsers than you are aware of. Apart from Firefox, Opera and Internet Explorer there is a number of promising alternatives which can improve your flexibility, increase your productivity and enrich your browsing experience. In fact, there are over 100 existing (although not widely used) browser applications. Most of them make use of the rendering engines Trident (Internet Explorer), Gecko (Mozilla Firefox), WebCore (Safari) and Presto (Opera 7 and above). However, some of them offer large fields for experiments and exploration — e.g. 3D Engines, but also really useful browsers with advanced functionalities such as desktop-tools integration. Recently we’ve selected over 20 Win/Mac/Linux-browsers, installed most of them, tested them, compared them and now present the results below. Let’s take a closer look at some rather unknown, forgotten, advanced or experimental browsers. What else do we have on the horizon? What should we use? And what might we be willing to use? Apparently, between Firefox, Opera and Internet Explorer there is enough room for creative and unusual approaches. This is Swiftweasel, an optimized build of the Mozilla Firefox web browser for Linux. Although we’ve recently seen a tremendous breakthrough of interactive web-applications, some tools such as file management or web browser are still left over to desktop-software. 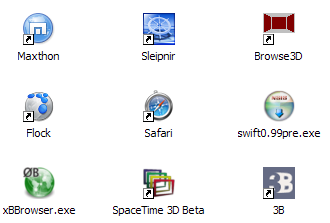 In order to actually use these applications, you need to install them on every PC you’re working on. Right? Not really. In fact, there are hundreds of portable applications you can use to carry your favorite programs along with all of your bookmarks, settings and email. You can use them on any Windows computer. All without leaving any personal data behind. Being open-source, portable applications provide a truly open platform that works with any hardware (USB flash drive, iPod, portable hard drive, etc). A portable version of Mozilla Firefox has the full functionality of Firefox bundled in a tiny encapsulated package. The main advantage of portable versions is the simple fact that they are usually much faster, can be used without installation and require less memory. So, for instance, the portable version of Firefox uses 35% less memory. And you can test web-sites on some external machines immediately, without installing all the necessary browsers first. Portable Edition is the Firefox bundled with a PortableApps.com Launcher as a portable app, so you can take your bookmarks, extensions and saved passwords with you. You can manage multiple profiles at once. The profile file will contain all the settings you made while running. So, your settings, history, passwords etc. are packed into a single file, then they are overwritten and deleted on the host machine (so you leave no trace). When you run Opera Portable on another machine, your settings will be applied again. You can find a truly portable version of IE 7 in Google as well. The Hyperengine web browser Sleipner is a very creative idea. Nice to know about it from here. Thankl you. Portable opera and firefox are cute.